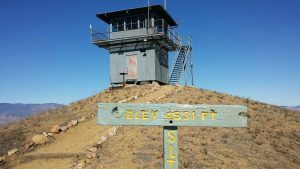 Built in association with the construction of Pyramid Reservoir in 1969, Slide Mountain is a live-in 14’x14’ Cl-100 cab a top an enclosed 10’ metal tower. Located high on the east end of Dome Mountain it has extensive views of the I-5 corridor and the Sespe Wilderness. It is staffed by volunteers from the Angeles chapter of the FFLA.